I’ve just drafted a wide-ranging paper dealing critically with our present incumbent energy system, its undemocratic characteristics and ecologically dangerous methods, and on the other hand an energy transition that “ought to be.” I’m putting forth the argument that energy transition, in addition to being the more obviously technical project, is also a social project. How we might go about some new collective formations to design and create a new energy system from the perspective of local, even individual organizational renewable energy projects, is one of the key questions I take up. I take a look at a couple examples of how a new energy system might be structured– micro-grids as public pool resource and socialized energy. In doing so, I take on the mythology that powerful monopoly utilities know what’s best for their captive masses. The paper isn’t an end-all, rather it’s a rough and raw beginning, and an invitation to RETHINK with us about how we can bring about meaningful change together. 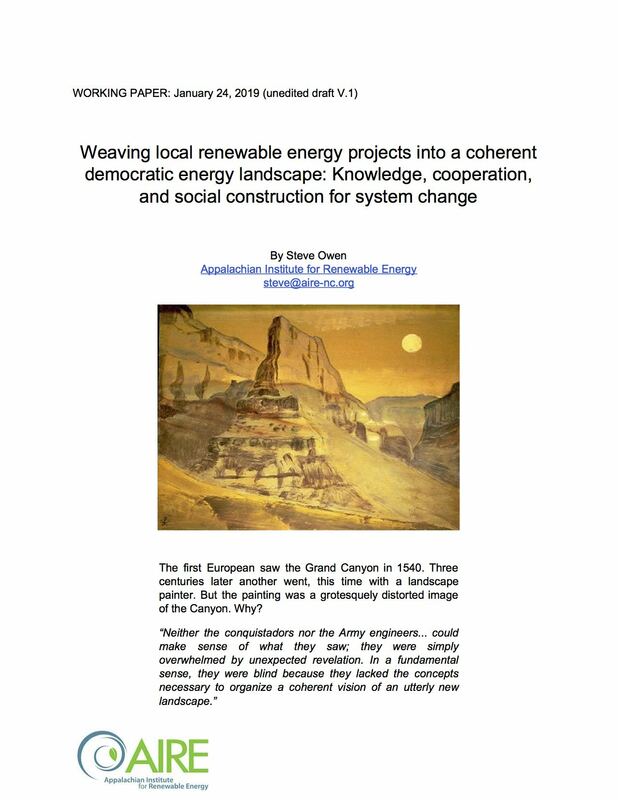 The paper is titled, “Weaving local renewable energy projects into a coherent democratic energy landscape: Knowledge, cooperation, and social construction for system change” and can be accessed at AIRE. I draw from experiences inside several thousand kilowatts of small projects development where even the smallest of barriers become evident, from scholarly research, journalism, and the work of other nonprofit think/do groups. For anyone not willing to wade in to a full-fledged “paper,” I’ll be breaking some of the key ideas down into more bite-sized blog posts soon. Those able to slog through, however, I hope some of you will also be able to engage in some of the coalition/network building and design how-to’s with us. I’m putting out the (literally) unedited version now and will begin cleaning up a Version 2 soon. My feeling is that the urgency of thought and dialogue now is far more important than the (slow) writing/publishing process itself.